It is that time of year again when the ATP Finals return to London and we are graced by a number scintillating matches to round off the season. This event is known to many as the unofficial fifth Grand Slam; its atmosphere world-renowned as fans revel in the buzz and the duels between the best in the business. And it is all live on Sky Sports. For the players, it is a chance to finish their season in style and add considerable points to their tallies. And, although Novak Djokovic has already sealed the year-end No 1 spot, all eight singles players will want to take home the 1,500 points that round off to the winner. Away from the ranking points, an undefeated singles champion will pocket $2,712,000 whilst a round-robin match victory ensures that player gains $203,000. In all, eight different countries are represented in the singles field for the third successive year. The action, a round-robin format of two groups before semi-finals and a final, spans across afternoon and evening sessions starting on Sunday 11 November - live on Sky Sports. The current world No 1 headlines Group Guga Kuerten. Djokovic's return to pole position earlier this month saw him become the first player to move to No 1 from outside of the top 20 in the same season since Marat Safin did it back in 2000. That movement highlights his form and despite a recent final loss to Karen Khachanov in Paris, the 31-year-old has turned his fellow competitors' heads and will be hungry to draw level with Roger Federer's current record of six ATP Finals tournament titles. John Isner, who starts his campaign against Djokovic on Monday night, replaced the injured Rafal Nadal and is the third oldest first-time qualifier in the competition's history. He arrives in London off the back of the most productive season of his career and one that saw him take his first Masters 1000 title at the Miami Open. Test your knowledge of the competition and don't forget to catch all the action on Sky Sports. Elsewhere in the group, Alexander Zverev will be aiming to progress past the round-robin stage for the first time in his second successive appearance at this year-end competition. His season signals this could indeed come to fruition as his year has included a third Masters 1000 title in Madrid. He was also runner-up in two other Masters 1000 finals and had a run into the last-16 at Roland Garros. Marin Cilic secured his fourth appearance in the competition as a result of a run to the quarter-finals at the Paris Masters. Federer is the highest-ranked player in Group Lleyton Hewitt having qualified for this season-ending event for a record 16th time. A tournament victory at the O2 Arena would mean the 37-year-old achieves an unprecedented seventh tournament title and it would deliver his 100th ATP title in total. The draw has fallen in such a way that another meeting with Kevin Anderson is on the cards and, if their outing is anything like their encounter at Wimbledon, we are in for a treat. Anderson is another who has enjoyed a remarkable season and as a result, he will finish inside the top 10 for the first time. Dominic Thiem has qualified for a third consecutive year and Kei Nishikori returns to the peak of the men's game after an injury-hit 2017. From this year's line-up, only Djokovic and Federer have ever won the competition before, five and six times respectively. As a result, maiden titles will be on the cards for others but the experienced duo could also be on a collision course for their fourth meeting in the competition's final. The evergreen Federer's first path to victory was back in 2003 when he was just 22 years old. The young man needed just three of the five sets on offer to beat Andre Agassi and went on to secure back-to-back titles with a win over Hewitt the year after. 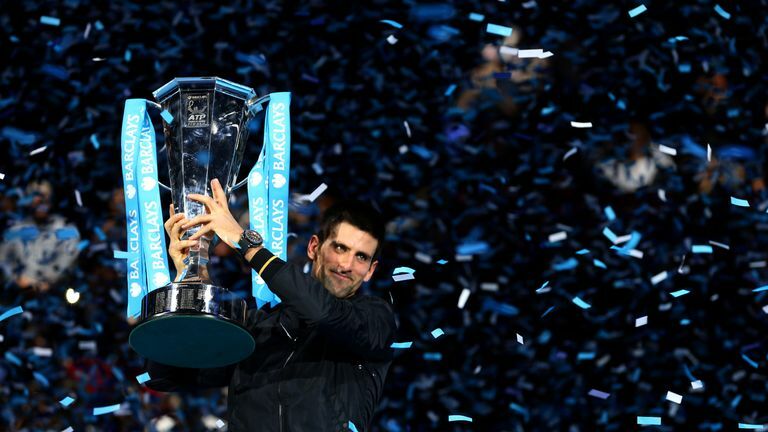 Djokovic's maiden title arrived in 2008 and a few years later he took a firm hold on the competition with four consecutive titles from 2012 to 2015, a successive series of victories that has not been matched by any other. Home support will be loudly given to Great Britain's Jamie Murray and his Brazilian partner Bruno Soares in the doubles competition. The duo have qualified for the third straight year and have reached the semi-finals in this event the past two years. On the Grand Slam stage this year, they made quarter-final appearances at Wimbledon and the US Open but have banked three ATP Tour titles, including a first Masters crown in Cincinnati. In Group Knowles/Nestor, Oliver Marach and Mate Pavic, the pair who have already secured the year-end No 1 ranking, will look to lead the charge from the front. The Australian Open champions know exactly how to progress through tournaments and end up in the big dance - they have been part of nine finals this season and won four. Join us live on Sky Sports Arena for the first day of the tournament where Murray and Soares open the doubles from Group Llodra/Santoro while Anderson and Thiem will commence the singles a short time later. Follow us all the way through as Sunday's evening session finishes with Federer starting his quest for that record seventh tournament title against Nishikori in Group Lleyton Hewitt.